goji89 wrote: Where did you buy yours from and are they expensive? From Hobby Search train section. They range from $8 to $15 depending on the model. Check every week if stock is sold out, usually it'll get restocked for a short time. Thanks! And I'll be sure to check every week. Looks good with that Gamera. Ok, so I'm in the process of making a Godzilla vs Spacegodzilla and I've run into a problem with making sets. I can never seem to get them right. They just never look good. Well, I can do hillside sets and forest like ones, but it's just the city ones I have a problem with. I know you can buy buildings, but I don't have the money for them and the ones you do buy that are good, are mostly plastic and you can't destroy them during the stop motion. Another thing I am having trouble with is making the rubble. I originally was tearing up paper and painting it to make it look like pieces of buildings, but this looked really bad and I hated how it looked. It didn't give it that chrushed up building feeling. This is basically what I want to accomplish. What I want to know is how would I make something like this. What is the rubble made out of and how was it made? What are those spikes made of? 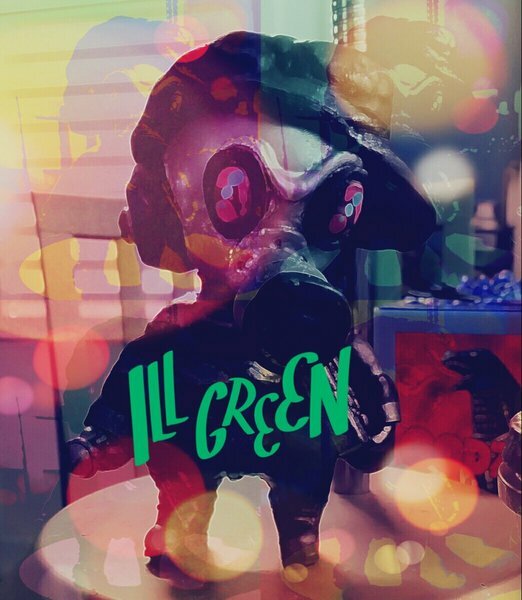 How do I make the background? How would I construct those buildings? Do you see the grey and white building to the far left? How do I do that? 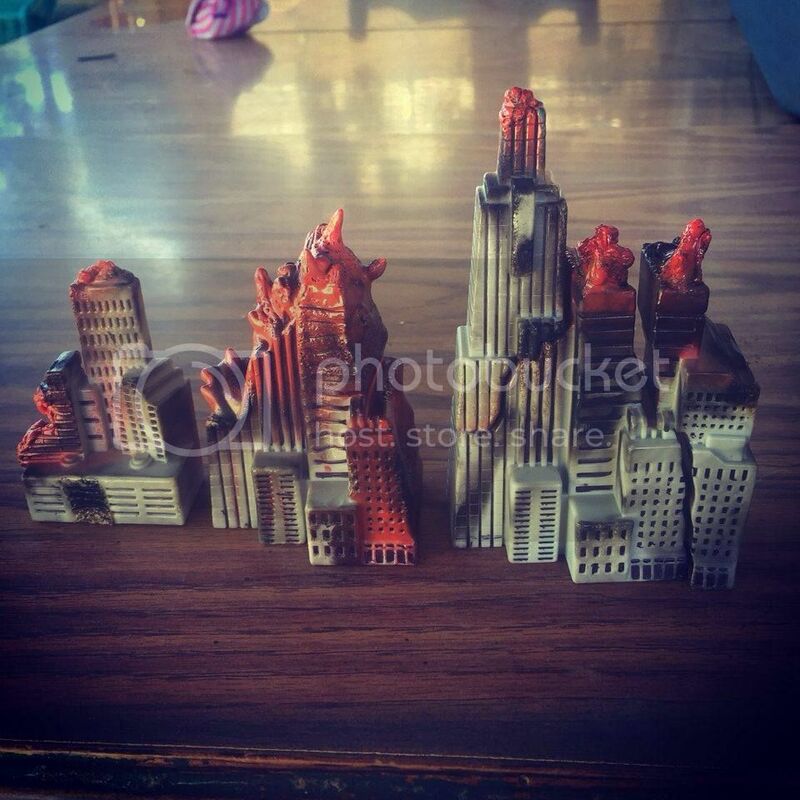 I think the buildings are cut out of foam to shape pictures of buildings but I am not sure. This may not be a diorama question but when I am photographing the action figures, they always cast a shadow on the back drop. How would I fix this exactly? Another thing I would like to fix is the problem with moving the camera as I shoot the film. If I move it to far off, it will catch unwanted footage because my background isn't long enough. People have told me that it is best I curve the backdrop so I don't get the unwanted background. Is this true? If anyone can answer thanks for your help! I use real pebbles and little rocks and spray paint them in grey, white, and light blue. Then glue them down. Clear epoxy. But you must learn how to mold and cast to create them. Youtube how to make a glove-mold. Thats the name of the technique, not to make gloves. Shapes like that are easy to mold. If you have skills in air brushing would be efficient. But any large photo or even a huge painting would be fine. Photoshop or MSPaint would do the job, then print to poster size. Colors should be matte to prevent glossing and shine. http://www.1999.co.jp/eng for all your cardboard buildings, click under Model Trains and browse around the N and Z scale sections. I prefer cardboard over the plastic buildings because you can customize them with a blade to look damaged, since no company makes damaged buildings except at O scale and thats too big for 6 to 8 inch monsters. This may not be a diorama question but when I am photographing the action figures, they always cast a shadow on the back drop. How would I fix this exactly? And for your final question, its best to have plenty of space for curving backgrounds around your set. Yes its essential and makes a square foot stage look like a huge world. A flat background can work too, but if you are shooting multiple angles, then curving the background around the set would be best. Look up: Casting and Molding, diorama vids, how to make war damaged buildings and anything in between. 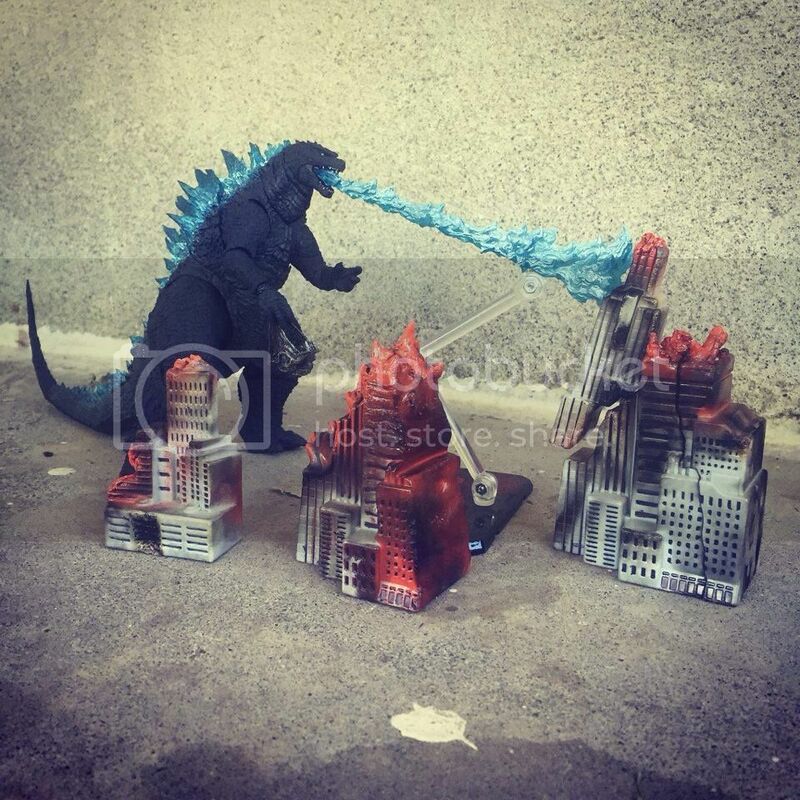 BARAGONZILLA wrote: Ok, so I'm in the process of making a Godzilla vs Spacegodzilla and I've run into a problem with making sets. I can never seem to get them right. They just never look good. Well, I can do hillside sets and forest like ones, but it's just the city ones I have a problem with. I know you can buy buildings, but I don't have the money for them and the ones you do buy that are good, are mostly plastic and you can't destroy them during the stop motion. Another thing I am having trouble with is making the rubble. I originally was tearing up paper and painting it to make it look like pieces of buildings, but this looked really bad and I hated how it looked. It didn't give it that chrushed up building feeling. Buildings are astonishingly easy to make and dirt cheap, at least in the scales we are talking about here. They don't need deep down super detailing. Just some basic architectural models really. You can do a better than acceptable job using Cardstock or if you need something more permanent sheet styrene. All of which is extremely inexpensive and may be found at any mass merchant hobby store. Really the only tools you need are a sharp hobby blade a metal straight edge ruler and some glue and paint. Is there a video I can watch so I can get a step by step tutorial. This is a good simple example of the basics. He is showing how to do "mock ups" out of cardboard. Honestly for what you are looking to do a slightly higher grade cardstock is a nice yet cheap choice. Depending on the figure you are messing with they run between 1:150 scale and 1:200'ish. You get a "close enough" match with N scale which is 1:160 and Z scale which is 1:220. If you want to spend a little money to make life easier you can get a Model Railroad Scale Ruler. This is a normal metal ruler but instead of being calibrated in inches and centimeters it is marked out in feet or meters in the various scales. So you can easily make a 100' building with no math conversions. What scale of model railways buildings should I purchase in order to be in scale with the SHMA vehicles? For SHMA stuff, 1:500 seems about right, though sometimes you can get away using Z scale. Birdman wrote: What scale of model railways buildings should I purchase in order to be in scale with the SHMA vehicles? SHMA Godzilla stuff is roughly between 1/600 and 1/700 scale. Rebirth is 1/656 to be exact, but as far as I know there are no model railroad sets in this scale. No, but there are specialty architech stores that have those supplies, if you wanna go the technical route and build your own from scratch. Some have cars and people up to 1:1000 scale too but thats like dust particles so becareful. If you need help making buildings, you can go to clever models.com, you can get layouts you cut out. They aren't too expensive. Kits are about $5. But you can customize them. They have n scale buildings which work pretty good. I found an extremely cool site you guys might like. It makes getting buildings a lot easier! 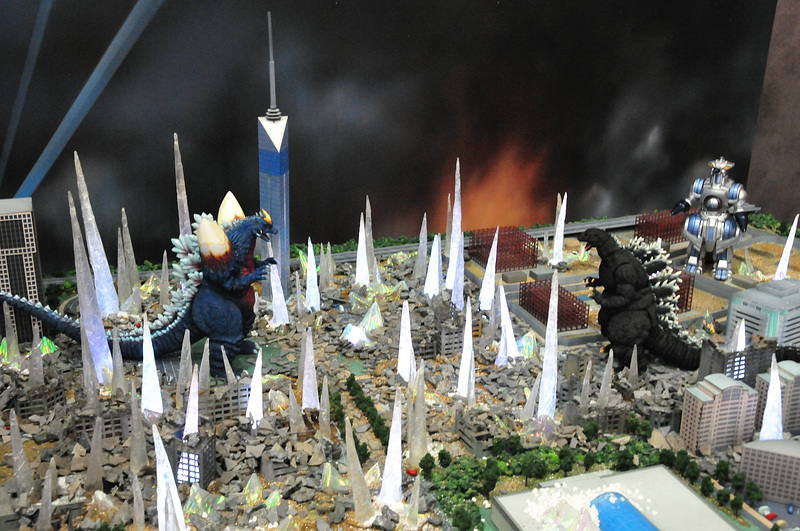 Does anybody know where to get tanks that have a good size for a kaiju diorama? Most of them are either too big or expensive - or both! I bought 4 N scale military Japanese tanks from Hobby Search last year. I'm checking now and they're all gone. Smallest tanks they have are 1:48 now. You need the 1:144 or 1:150 scale for kaiju 11 inches or more. However, hlj.com has the 1989 Mazer at 1:144 scale. That should hold you down for a while until N scale tanks pop up again. And don't be discourage if tanks look too big, in reality tanks and mazers are freekin huge. I decided to have a go at some of those destruction buildling from the G14 playset, scaling is off but I'm pretty happy with the way they turned out. Used spray paint, a sharpie a lighter and a nail. Hope you guys dig em. They aren't in scale or anything I'm sure, but I'm glad I could do something cool with an otherwise lackluster bit of the collection. Damn good, really looks like fire. Should've done a before and after pic. But whutcanya do. You did it. You take the heat.